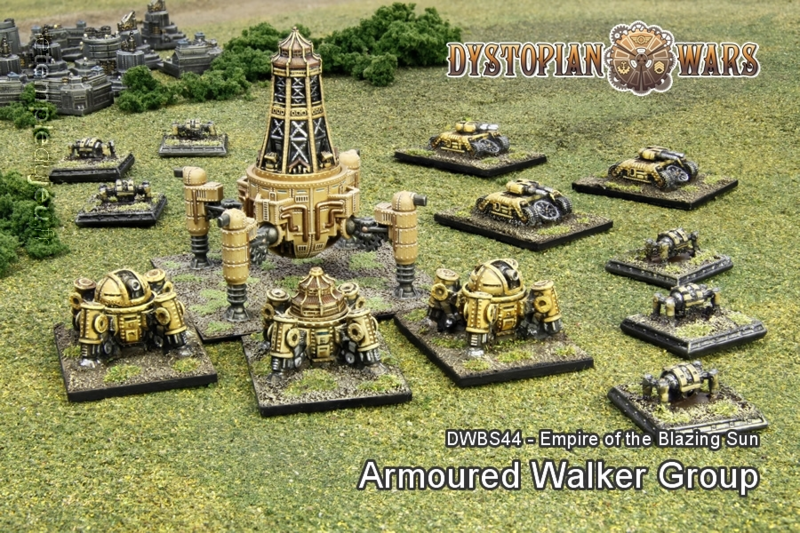 Inside this box is an Empire of the Blazing Sun Armoured Walker Group. Consisting of the most advanced machines in a Blazing Sun General’s arsenal, this Group makes a powerful vanguard for any force. Fast moving Gyro Tanks can run up the flanks whilst great Walkers of all sizes stomp their way towards the enemy, letting loose cannon shells and rocket propelled samurai warriors to bring the ... <lire la suite>. Inside this box is an Empire of the Blazing Sun Armoured Walker Group. Consisting of the most advanced machines in a Blazing Sun General’s arsenal, this Group makes a powerful vanguard for any force. Fast moving Gyro Tanks can run up the flanks whilst great Walkers of all sizes stomp their way towards the enemy, letting loose cannon shells and rocket propelled samurai warriors to bring the enemies of the Empress to their knees. Contains : 1 x O-I Taka Ashi/O-I ’Miage-Nyudo’ Class Heavy Walker, 3 x Myobu Class Light Gyro Tanks, 3 x Ronin Class Heavy Walkers and 6 x Bansan Class Small Walkers. Models unpainted and unassembled.